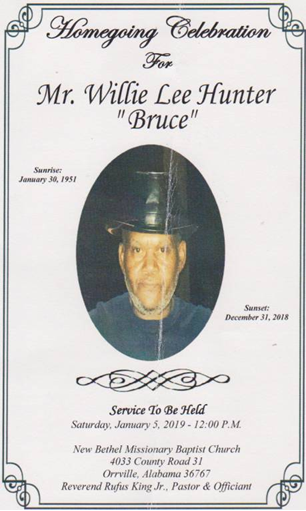 Willie "Bruce" L Hunter 67, of Selma, entered eternal rest December 31, 2018 in Selma. Funeral Service are scheduled for Saturday, January 5, 2019 12:00 Noon at New Bethel Baptist Church Orrville, AL with Rev. Rufus King officiating. Burial in New Bethel Church Cemetery. Walker Mortuary directing.